“…there will be a time when we must choose between what is right and what is easy.” Professor Albus Dumbledore. 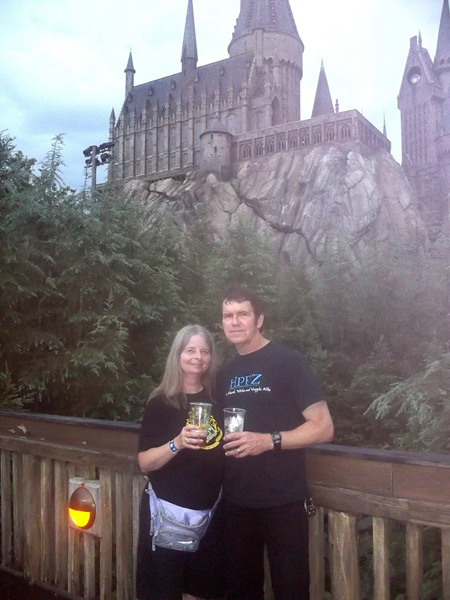 Harry Potter Educational Fanon (HPEF) held its 8th and final event, “Ascendio”, in Orlando, Florida July 11 – 15, 2012 in the shadows of “Hogwarts Castle” at The Wizarding World of Harry Potter at Universal Studio’s Portofino Bay Hotel. As Professor Dumbledore reiterated in his famous quote from “Goblet of Fire”, HPEF decided to choose the “right” path rather than the “easy” path when they sacrificially and joyfully took on the immense efforts of coordinating and organizing a conference of this magnitude for Potter fans. Approximately 1000 loyal and enthusiastic Potter fans filled the hallways of the conference center at the hotel for 4.5 days, some dressed in Potter costumes or as Potter characters and some in regular street clothes. All were welcome at the conference which offered something for everyone….. Presentations: For those seeking educational opportunities, there were dozens of presentations to choose from with topics ranging from fan fiction to spiritual analysis of the books to scrapbooking and comparisons with other fan-based movies such as Hunger Games. Presenters such as John Granger awed us with his Ring Composition lecture, Connie Neal and Ben Shrank amongst others spoke in the keynote luncheon on Generation Potter: Fifteen Years Later and actor Chris Rankin delivered a presentation on After the Saga Ends. Other presenters included Leslie Barnhart with her presentation on Alchemy: A Rose by Any Other Name, JK’s Women presented by Valerie Frankle and Gwendolyn Grace, Harry Potter and Wicca by Rick Tinsley and PhoenixSong and the Order of Virtues presented by David James Gras. Artistic: For those liking artistic performances, there were musicals and plays to choose from including the famed Team Star Kid and the newly created “Wands by Wands by Wizards” musical and “Mischief Managed” play featuring Mugglenet’s Eric Scull as James Potter. The Art Gallery also offered a variety of superb pieces of artwork. Sports: The International Quidditch Association offered a chance to not only observe this popular wizard sport but also to play the muggle version (of course riding on broomsticks!). Literary: Author Palooza, Quill Track and Book Faire offered author presentations on diverse subjects ranging from fan fiction to deep analysis of various themes offered in the Potter series as well as various themes outside of the Potter world. Shopping: Shoppers were delighted with the offerings of the vendor room – hats, t-shirts, brooms, jewelry and candy to enhance the Potter experience as well as the ever-necessary wand in various shapes, sizes and colors. Music: Wizard wrockers delighted those musically aspired with several performances by groups such as Whomping Willows, House of Black and Bella and LeStrangers. Meet-Ups: There were dozens of “meet-ups” for small like-minded groups such as Fabulous Fandoms, Hogwarts Alumni Running Club, Hufflepuff Pride & HP and Education to name a few. Podcasts: Podcasts from Mugglenet and Hogwarts Professor (John Granger) offered various topics of discussion from Academia and retrospective look-backs on 7 years of podcasting. Common Room: For those looking to just hang out and grab a snooze on a soft couch. Special Events: The “Wanded and Fabulous” fashion show showcased a variety of Potter fan-dom style costumes while FOX local TV came out to interview and show clips from a Quidditch game. In other areas events such as “The Hillywood Show” kept us entertained. Stars: For the star-gazers, we were given the opportunity to meet and greet Chris Rankin (Percy Weasley) and Afshan Asad (Patma Patil) who not only signed autographs and posed for endless pictures but gave their own presentations and also enjoyed just mingling with the crowd! The Night of a Thousand Wizards II took place inside The Wizarding World of Harry Potter at Universal Studio’s Islands of Adventures on the evening/night of Thursday July 12. The event officially started at 9pm when all muggles finally cleared the park and hence that magical part of the park now belonged to us alone! A private party in this part of the park had to be a thrill just in and of itself to any true Potter fan. As the sun set and lights twinkled, the park became ours for 4 hours. Some donned in costumes, all fans had the opportunity to ride the 3 Potter-themed rides including the acclaimed “Forbidden Journey” as many times as they wanted, partake of the fantasy of “Ollivanders Wand Shop”, browse the succulent aisles of Honey Dukes, taste the delights of “Three Broomsticks”, pick out the perfect souvenir at Dervish and Banges, and relax and enjoy performances by the Durmstrang guys and the Beauxbatons girls, the dj spinning music, a literary discussion by Hogwarts Professor John Granger, and the nice selection of complimentary desserts and drinks (including endless Butterbeer!) The witching hour of 1am arrived all too soon and as the last people were escorted from the park (yours truly included! ), we sadly looked back and realized the magic we had just experienced, and wondered if we would have this golden opportunity again without organizations such as HPEF to do all the organizing and planning for us? The second highlight was the To the Manor Ball on the last night with everyone dressed in their best witch and muggle costume – potions such as “Dragons Blood”, “The Phoenix” and “Whomping Willow” were available for purchase. Music filled the air while some danced the night away. Friends, old and new, mingled and partied until the wee hours of Sunday morning. The leaving feast Sunday morning gave everyone the chance to say goodbye and offer their thanks to HPEF staff who tirelessly gave of themselves for months for this conference to become a reality. Hogwarts Professor, aka The Dean of Harry Potter Scholars, John Granger, gave a tribute to HPEF in several of his presentations and podcasts during the conference – he reiterated that “HPEF gave Potter fans 10 magically awesome years of educational programming through trials and tribulations affording everyone an opportunity to be a vital part of Potter fandom. HPEF paved the way for Potter web sites, blogs, books, meet-ups, etc. to be developed, as well as thousands of friendships to be established over the years.“ As John spoke, tears formed, hugs ensued, and thanks permeated from the hearts and minds of those in attendance to the staff, current and former, of HPEF who have tirelessly devoted part of their lives for us. There are many people who have worked hard over the years, but to name a few, Gwendolyn Grace, Flourish Klink, Heidi Tandy and Bekki Oliveri.